At Eastland Alpacas we include six months free board for alpacas purchased from us, if needed, until you prepare for their new home. After that time, fees are outlined below. We use Platinum Blend Alpaca Feed and free choice vitamins and minerals along with orchard grass hay. The hay is grown and harvested every 45 days (to retain tenderness and the most nutrients) during the summer months at our farm. Fresh water is always available from our automatic heated waterers, which are cleaned daily. Our alpacas, and yours, have the freedom to go from the barn to the pasture as they please. Services include routine worming, nail care and yearly vaccination. Veterinary services are not included and will be billed to you separately. Livestock insurance on your alpacas is at your expense and is required. You are welcome to come visit, train or play with your alpacas at anytime. Or...you can take them for a walk around our 30 acre farm. Boarding fees are $3.00 per day. Four months free boarding for crias born to your female. After four months, regular rates apply. Boarding is billed at the beginning of the month for the previous months board and is due upon receipt. 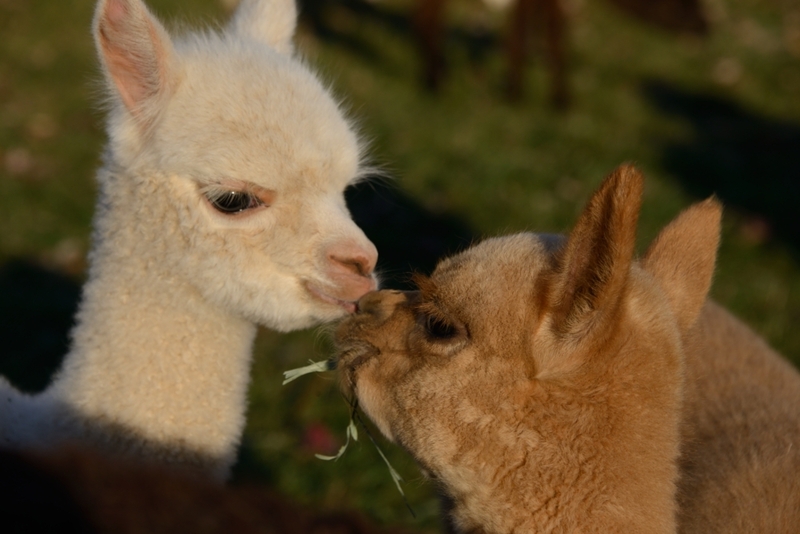 Your alpacas will be cared for daily along with our own alpacas. They will be given the same loving care as if they were our own. We love raising alpacas... they are just like children with their own personalities and their cute little faces. We are sure you will enjoy raising alpacas too! At Eastland Alpacas have found Golden Blend Alpaca Supplement to be very beneficial for our herd. The ingredients and processing of this feed is outstanding. Golden Blend has one of the best nutritional alpaca feeds available, and one of the safest. No chemical preservatives, or drugs, are used in any Golden Blend products. This product is designed to provide additional value by increasing reproductive health, breeding success and is specially formulated to promote the healthiest fiber and coat production possible. By using a good quality roughage and Golden Blend Alpaca Feed you will provide these wonderful creatures the optimum levels of minerals for longer and healthier lives. Animals that have their nutritional requirements met will be more content and have lower maintenance and care costs. Every bag has the quality and consistency to guarantee your success! Please call or e-mail to order. Custom Milling Inc, has studied the alpaca at length and have worked with several Universities and Veterinarians to determine what the right feed and mineral formulas should be. Through this research it is now understood what the alpaca producers need to maintain a healthy herd and produce top quality crias. Since alpacas are raised for their fiber, it makes sense that they be on a dietary plan that will ensure that the fiber meets all the required standards for the producers. With this in mind, Custom Milling sought the help of nutritionist's and universities and looked at the other alpaca products that were on the market before developing this formula. Golden Blend Alpaca Feed is an all grain feed made with only natural grain products. Since it contains no animal by products or fillers, your animals digestive system is able to utilize a large portion of the nutrients contained in the feed. The palatable pellets have less dust to minimize choke and cut feed costs. Each vitamin and mineral has been balanced with its counterpart. Selenium plays a major role in the normal development of the fetus during pregnancy and vitality of the newborn. Vitamin E to help protect against "white muscle disease." Zinc is necessary for the mobilization of Vitamin A. A highly available source of organic zinc is added to improve skin condition and promote high quality fiber. If your formula is not balanced, the vitamins and minerals can be locked out. You will find that your animals will feel better. Ageing causes many problems in older animals. They absorb less and less nutrients as they age. This is one reason why the probiotics have such a dramatic effect on older animals. Probiotics enable them to utilize more of the nutrients in their feed, pasture and hay. Golden Blend Chelated Alpaca Minerals are very palatable. We have known for years what the universities and leading veterinarians are just learning. It doesn't matter how good your minerals are, if you animals don't eat them, they won't work. If your alpacas do not like minerals, try these. You can feed the minerals free choice or you can top dress the feed. You don't need to add anything else. Up to 12 months, 0% interest with 1/3 down payment. Buyer may take delivery with down payment and proof of Livestock Insurance. The registration of the financed alpacas and any crias will remain in our name until paid in full. All alpacas are guaranteed to be healthy and injury-free at the time of sale. We offer a 30 day live birth guarantee. All female purchases include a free re-breed to one of our herdsires at our farm. **The above terms and conditions may change at any time. us and we will work together to meet your needs. For alpacas purchased at Eastland Alpacas we will provide delivery from our farm to yours, free of charge, depending on your location. A fee will apply for further deliveries. Transportation can be arranged for delivery anywhere within the states using one of several transporters. Free delivery for local buyers. Fees for further transports depend on location and/or transporters fees.